Saw this come across my Facebook feed and I have to be honest. I thought to myself. Enough. What connection could the story of Purim, that happened well around the year 357 BCE (i.e. 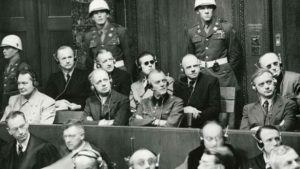 well over 2,000 years ago) have with the Nuremberg trials that took place in 1946. Well, apparently, I’m wrong. Amazingly enough, there does indeed seem to be a connection and as Purim comes close, it’s a great thing to learn. Of course, what it means is that the ancient story still comes alive today. But more, it carries the reminder that we have to be vigilant and deal with the Hamans of today. Purim is the story of a foolish king, an evil adviser, and a vicious plot. In reality, it’s not just a story, but an historical event that nearly resulted in genocide. If Haman’s plan had worked, the Jews of Persia and beyond would have been systematically murdered. Instead, it was Haman and his sons that swung from the gallows he had built. And, it was the Jewish people who walked into lightness and to this day celebrate. Still, there are lessons to be learned. Even today, there are ridiculous kings, evil advisers, sickening plots to attack and more. Each day brings news of new attacks against innocent people. More, terror is spreading across the globe. New Zealand. Amsterdam. Ariel. Always learn from the past – that’s one important lesson. As Purim approaches, amid the joy, remember.